Ahead of an expected special event in September, Apple suppliers are supposedly ramping up manufacturing of both 9.7-inch and 7.9-inch iPad models, with the larger version expected to debut as soon as this quarter. 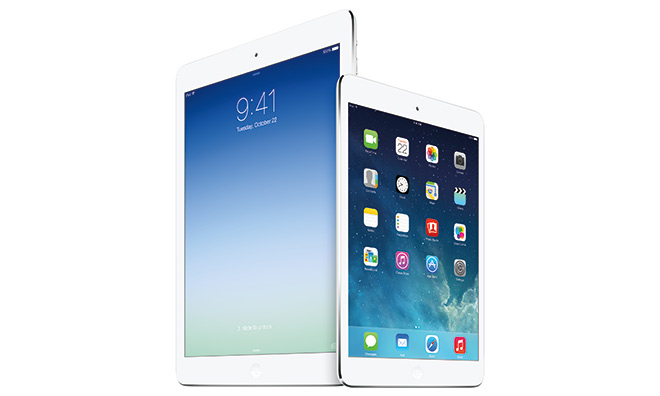 Citing sources familiar with Apple's supply chain, Bloomberg reports Apple's partner suppliers in Asia have started mass production of the next-generation 9.7-inch iPad, while a new iPad mini version enters early stages of assembly. The larger version, thought to be a follow-up to Apple's iPad Air, should see launch by the end of the third quarter or early fourth quarter, sources said. Initial stock may be constrained, however, due to manufacturing issues related to the application of an anti-reflective screen coating, a new feature for Apple's tablet lineup. Previously, iOS device screen treatments have been limited to oleophobic, or fingerprint-resistant, coatings. As for the iPad mini, not much was offered in the way of new information aside from claims that the tablet is also entering production and should hit store shelves by the end of the year. The next-gen iPads are expected to be a revision of current hardware, with the most notable change being the inclusion of Apple's Touch ID fingerprint sensor. Aside from the reported anti-refelective coating, the iPad should get the usual performance upgrades and minor design tweaks consistent with an annual product refresh. Most recently, photos of a "leaked" chassis supposedly bound for the "iPad Air 2" showed off recessed volume control buttons and a revamped speaker grille layout. While the exact launch dates are unknown, Apple is rumored to be planning a special media event for Sept. 9, which is expected to focus on the next iPhone.